Techland is really going all out with the upcoming Dying Light Enhanced Edition update. Already they showcased how there will be a new enhanced legend leveling system and now we see that they are adding new bounties into the mix. 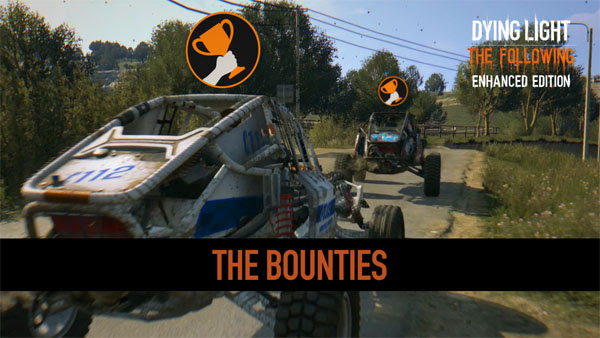 There will be 3 different kinds of bounties introduced – basic, daily, and community. What’s great about this is that everyone who has the base game right now will be upgraded to the Enhanced Edition regardless of whether or not you get the upcoming DLC, The Following. Dying Light: The Following – Enhanced Edition, which launches February 9, 2016. January 19th, 2016 – Wroclaw, Poland/ When it launches February 9th, 2016 on PC, Xbox One, and PlayStation 4, Dying Light: The Following – Enhanced Edition will bring plenty of additional content and new features. Today Techland released the second video of its Highlight series, in which the developer details three distinct categories of the new in-game challenges, called Bounties. “Bounties | Dying Light: The Following – Enhanced Edition Highlight #2” can be viewed here. Bounties will be a part of Dying Light: The Following – Enhanced Edition, which launches February 9, 2016. Players who already have the base version of the game will receive Bounties plus plenty of other upgrades as part of the free improvement update to be distributed at the same time.